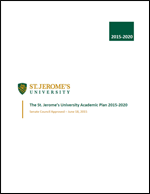 The St. Jerome’s University Academic Plan 2015-2020 is built on a shared vision of an academic community that is collaborative, collegial, inspirational, and creative. In this plan are the perspectives of students, faculty, academic support staff, alumni, and key external stakeholders who are affected by our academic activities and outcomes. Our plan is presented as a statement of how we understand ourselves in light of our 150-year history, as an affirmation of the importance of the liberal arts for society, and as a set of priorities that will guide the development of our academic activities over the next five years.